Warm these delicious buns through briefly before serving to enjoy at their best. Mix the flour, yeast, butter, eggs and caster sugar in a bowl. Add 100-150ml hand hot water and mix to a soft but not too sticky dough. (If necessary, add a little more flour to make the mixture more manageable.) Turn out onto a lightly floured surface and knead for about 10 minutes until smooth and elastic. Put in a lightly oiled bowl, cover with clingfilm and leave to rise in a warm place for 1-2 hours until the dough has doubled in size. Cut out 12 x 14cm squares of baking parchment. Mix the ricotta in a bowl with the vanilla sugar and 50g of the blueberries. 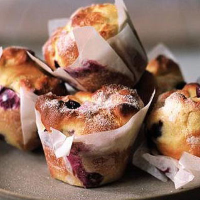 Press a square of parchment into one section of a muffin or Yorkshire pudding tin and drop a bundle of dough into it. Repeat with the remainder then cover loosely with clingfilm and leave to rise in a warm place until risen to about half the size again. Bake the buns for 15 minutes, until golden. Lift onto a wire rack and sprinkle generously with the extra vanilla sugar. Serve warm or cold.